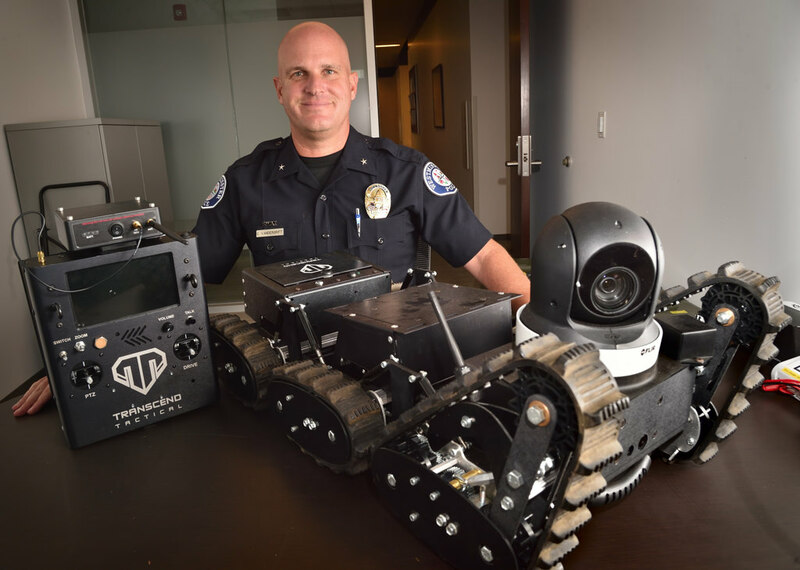 WESTMINSTER PD Commander Cord Vandergrift with the remote robot the department acquired from Transcend Tactical that includes a thermal imaging camera. (Photo by Steven Georges/Behind the Badge). The word “robot” elicits all manner of reactions – from visions of artificial intelligence taking over the world to incredible Iron Man-like capabilities. But whatever thought the term may inspire, the 50-pound compact machine made of metal, plastic and electronics that has recently been added to the Westminster Police Department tool chest has an undeniable cool factor. Most importantly, the new police robot has the potential to save lives. WPD Commander Cord Vandergrift, who sought out a robot for use by West County SWAT, said since purchasing it, it’s already been used in the field twice. Once was during a warrant search with armed suspects. The robot was sent in to clear the property first without risking officers’ lives. He said the SWAT team was grateful to have the robot. “That’s intel they would not have had without the robot,” Vandergrift said. The police robot is outfitted with wheels and a camera — almost resembling a tiny SWAT vehicle. It is directed by a separate controller. The person holding the controller can direct the robot down hallways and into rooms, outside on gravel, up stairs and can even push unlocked doors open. Through the controller, the officer also can communicate via a speaker system with a suspect. The camera on the robot gives the officer sight while directing it and also when encountering a suspect. There’s a small screen on the controller itself. Vandergrift said with the range of this robot, an officer is able to sit inside the armored vehicle while driving the robot through a house that is being cleared. “We’ve had great success with ours,” he said. The agency purchased the robot in June, at a discount, from Transcend Tactical. He said his company’s patented spring-loaded articulating joint technology gives the robot the ability to climb stairs without the learning curve or high costs. “Our mission is to get at least one of our robots in every police department to save as many lives as possible,” he said. As the company further develops its products, there are potentially more robot upgrades on the way for the agency, including a wheeled carrying case, an infrared camera and a tactical gas canister attachment. For more news, issues and personalities on local law enforcement, go to http://www.behindthebadgeoc.com .